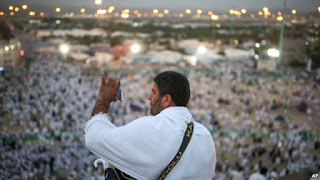 A Muslim pilgrim takes a photo with his mobile phone from atop a rocky hill called the Mountain of Mercy, on the Plain of Arafat, near the holy city of Mecca, Saudi Arabia, Wednesday, Sept. 23, 2015. The annual hajj pilgrimage in Saudi Arabia peaks Wednesday with 2 million Muslims packing the valley of Mount Arafat for a day of prayer. The site is where the Prophet Muhammad is believed to have given his final sermon about 1,400 years ago calling for equality and unity among Muslims. Lasting five days, the hajj began Tuesday with pilgrims circling the Kaaba, a black cubic structure in Mecca's Grand Mosque toward which all Muslims pray. From there they visit Mina before proceeding on to Mount Arafat. Islam requires all able-bodied Muslims to perform the hajj once in a lifetime. The pilgrimage is among the five main pillars of Islam, which also include belief in the oneness of God and the Prophet Muhammad as his final messenger, five daily prayers facing toward the Kaaba, annual charity and fasting during the month of Ramadan. 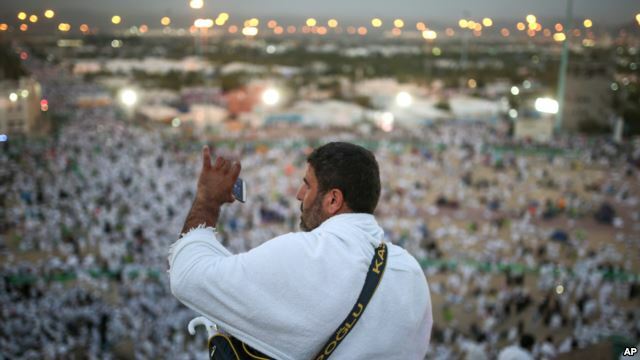 For many, the hajj will be the highlight of their spiritual lives. The pilgrims were undeterred by a construction crane collapse at Mecca's Grand Mosque earlier this month that killed 109 people, including foreign pilgrims. About 400 people were injured by the crane, which was working on an expansion of Islam's holiest site.